It's time for spring cleaning again. It's taking me forever; I keep unearthing lovely treasures from my closet. 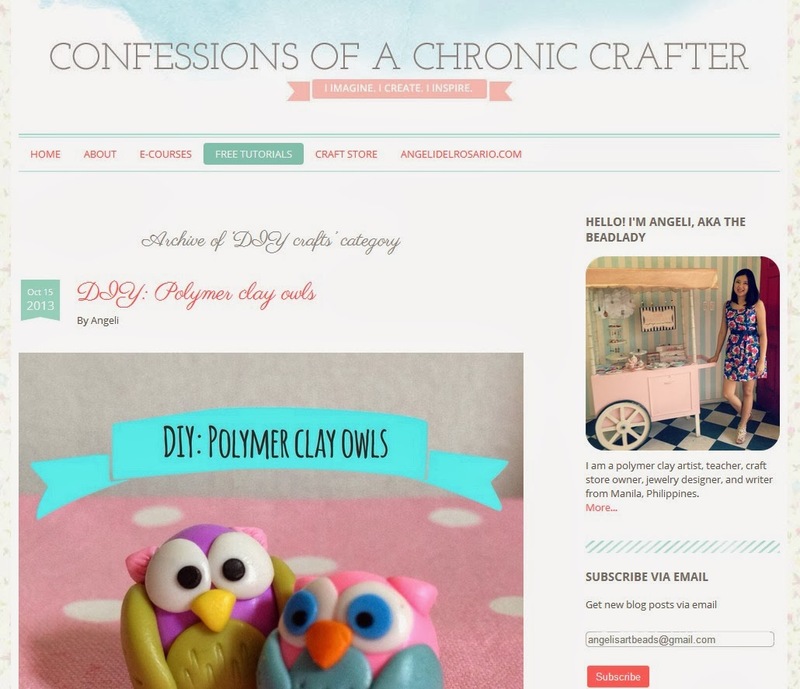 What's going to delay the process even more is blogging about my finds. Teehee. I love dessert. I love stationery. Put them together and it's going to be hard for me to resist. 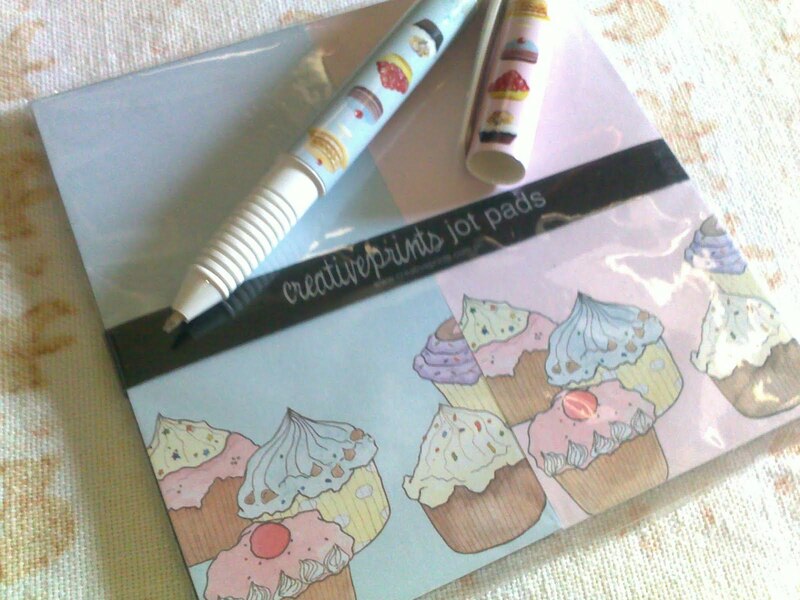 But what's better than finding dessert-inspired paper products? Finding a pen that matches! 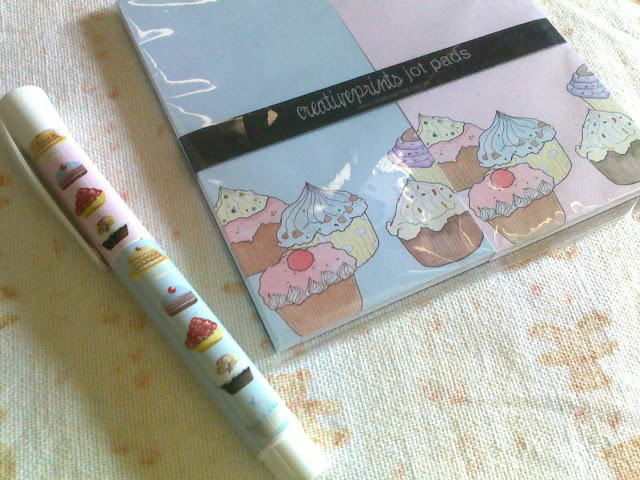 I scored this cute cupcake notepad set at the St. James Bazaar last December (Php140 from Creative Prints, around $3). It's designed by a young local artist whose name escapes me at the moment. 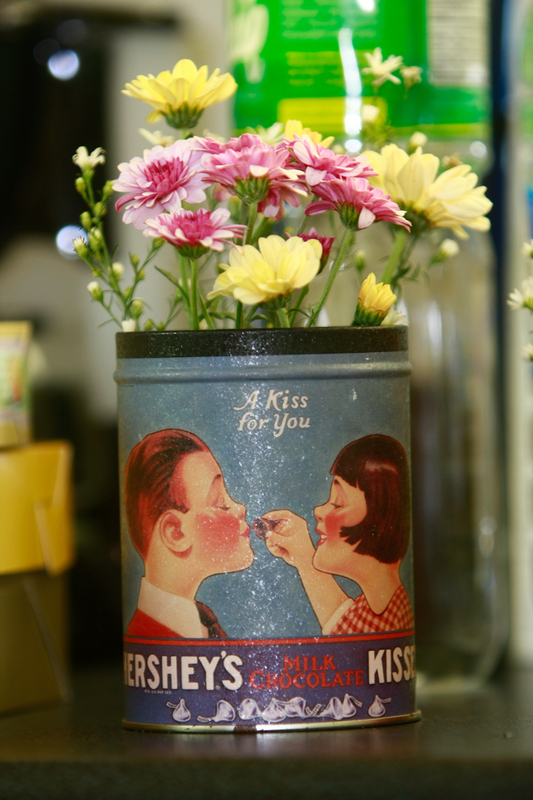 Then last month, my cousin found this adorable pen in one of the stalls at Market! Market! They come in different designs, and are sold three for Php100 (around $2.25). I didn't even realize it matched the notepads perfectly (same shade of pink and blue, even!) until I took this picture. It wouldn't be my wedding if there weren't any handmade touches. 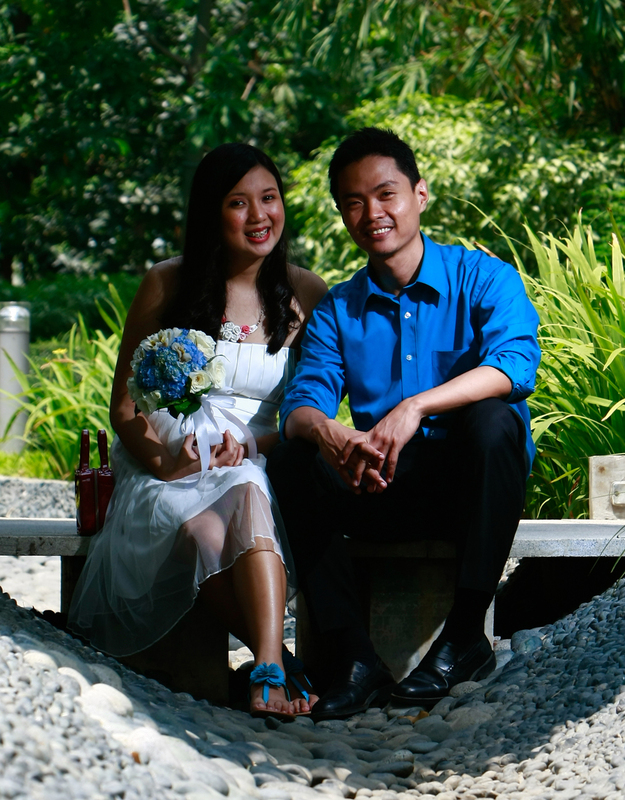 We were on a tight budget, so we considered going the easy route and send the invites through email, facebook, or SMS. But being the crafty girl that I am, I couldn't stand not making an effort. I'm not much of a graphic designer, so I knew I couldn't make the e-mail invites as special as I wanted them to be. But give me paper, scissors, and glue, and I can whip something chic but cheap. So with the blessing of my hubby-to-be, I trooped to National Bookstore and bought ready-made textured aqua envelopes and some glue. I planned on lining the envelopes with pretty fabric. I had a collection of fabrics at home, but just as a fail-safe, I bought half a yard of some shabby chic fabric for Php65 (about US $1.45). The invite set the theme, and from here on I knew what I wanted the wedding to look like. I already did the layout for the invite text the night before, so I had it printed on translucent paper which looked like vellum, but was a lot harder. It cost around Php16 per invite. I would then print a map of the venue at home, on blue board paper (printing of the map would be free, care of my mom's printer, teehee). When I got home, I traced an outline of one side of the envelope onto the fabric, and proceeded to cut them out. I slid the fabric into the envelope, but realized I couldn't glue them together properly without having to cut open the envelope. Fail. So I decided to make my own envelopes out of the same blue board paper the maps were to be printed on. I opened up one ready-made envelope, and made a template. I then cut each envelope by hand. The process was time-consuming, but boy did I have fun! When Marco saw the handmade envelopes, he said they were pretty, but they might be too pretty for our wedding. He said I was putting too much effort into it. He suggested we use the ready-made envelopes without lining instead. I replied in true crafty fashion, "Do not take away from me this chance to be creative!". Lol. I actually said that, verbatim. I already had all the materials I needed anyway, so it wasn't like it was costing us extra. But I eventually gave in. I only made a few of the special handmade ones for our Ninongs and Ninangs, and grandparents. Other envelopes were lined with pretty scrapbook paper instead of fabric (as in the photo above). Others remained plain, without lining. I wish I could post DIY pics here, but I didn't exactly have the time to take step-by-step photos. I will update this post when I have pics. 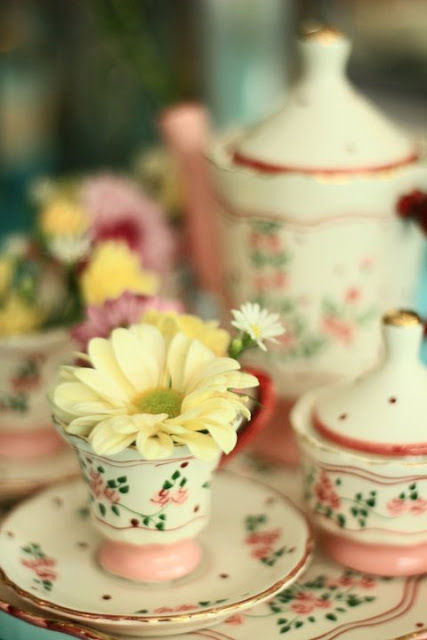 I decided on a summery, floral theme, with a bit of vintage touches. I would use my tiny lattice lanterns and old tin cans as vases, and these will serve as centerpieces at the reception. I knew they'd be too tiny, but what could I do, floral bouquets will cost us a pretty penny, and were bound to be thrown away after a few days. I wasn't about to throw away our money. 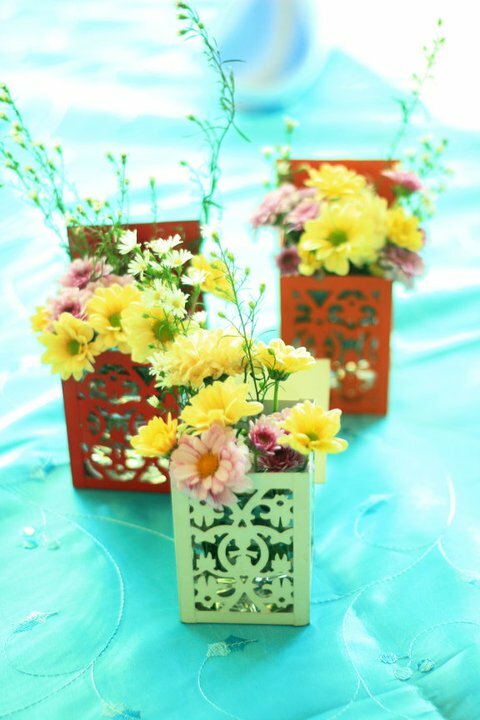 These DIY centerpieces were better than nothing, I decided. For a girl who doesn't know how to apply makeup, you'd think hiring a stylist would be the best option. But fate decided to play a trick on me, and sent my go-to parlorista away on vacation. So I had to look for a decent parlor that was near my place (I didn't want to travel far on the day of my wedding) to do my makeup. Hiring a makeup artist was out of the question - we didn't have a budget for that. Thank goodness I had the right mind to request for a trial makeup session. It gave me the chance to see how ghastly I would look like under the hands of the parlorista I went to. I asked for a light, natural look, but the parlorista interpreted it as white, cakey makeup. I looked like I was ready to be buried! Even my dad couldn't help but comment, "Anong ginawa nila? (What did they do to you?)". LOL! But I loved what they did to my hair. So I decided to do my own makeup, but I would go back to the parlor so they could add soft curls to my hair. My mom would help me put eye makeup on. I would do the rest. On April 2, 2011, Marco and I exchanged I Do's in a small civil ceremony in front of our family and a few close friends. It was the perfect wedding for us because : 1. We were both too lazy to deal with all the preparations. I was on the brink of turning into Bridezilla before, I wasn't about to go through that again; and 2. We didn't have a lot to spend, so the cheaper the better! Given these two reasons, we knew what to expect. But everything turned out to be better than what we could ever hope for. As I said, all it took was the help of our family, a little creativity, a ton of prayer, and kisses from Lady Luck. My dad works overseas, and so does Marco's ate (Ate Norren). This summer is one of the rare times they'll both be in the country at the same time. But their vacation schedules were overlapping on only one weekend: the weekend of April 2. We had to take advantage, it was just the one. Ironically, for something as romantic as a wedding, our government still had a say. 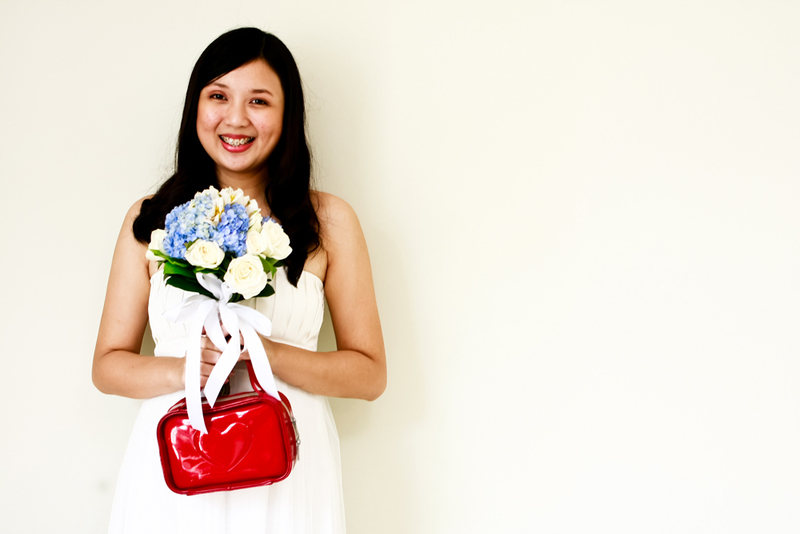 The wedding date was at the mercy of whether or not the Civil Registry would grant us the date. It only took two weeks to pull off the preparations for the wedding and reception, but a couple of months before, we started applying for all the nasty government forms. These forms were the reason why we only had two weeks to prepare for the actual event. To get married, you needed a marriage license. 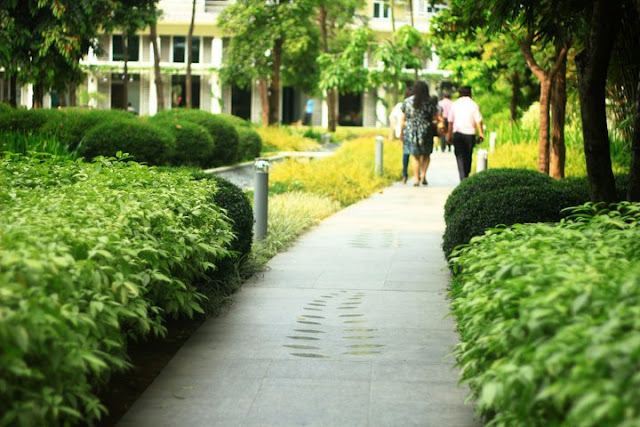 To get a marriage license, you needed birth certificates authenticated by the National Statistics Office (NSO) , and a Certificate of No Marriage by the same office. You also needed to attend a seminar on family planning by the City Health Office and another one by the DSWD (I forgot what it's called). One of you (either bride or groom) needs a barangay clearance. You had to wait three days for the NSO certificates. You needed to make an appointment a week before you can take the seminars. Then it takes them 10 days to release the actual marriage license. Finally, two weeks before April 2, we finally got our license. We finally booked the date with the judge. 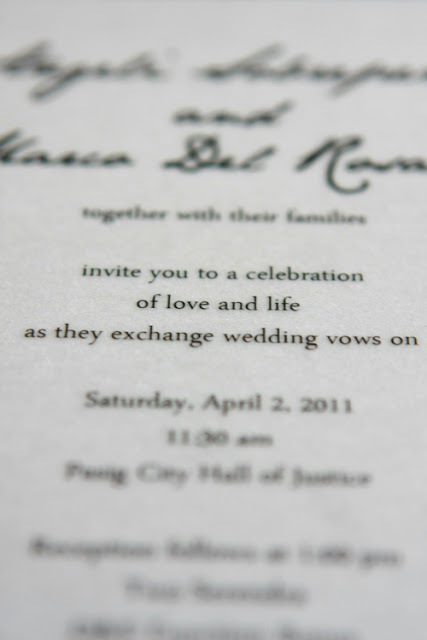 We were to be wed at 11:30am, at the Pasig Hall of Justice. I would have wanted a late afternoon ceremony, so we could do the reception in the evening. But I was told judges do not normally do Saturday weddings, much less Saturday afternoons - so I was more than lucky that this judge decided to open an April 2 date. Lady luck's kiss # 1! We could finally book the reception venue. We could finally tell all the Ninongs and Ninangs the exact wedding date and venue. Finally. The following details are arranged chronologically - in other words, I'll mention them in the order of when we booked/bought them. Being true foodies, we went after the reception details first. haha. We know our priorities. After doing the math, we decided that hiring a caterer + booking a venue was going to save us a lot of money versus doing the reception at a restaurant, where you had to pay a certain amount per head. Lady Luck's kiss #2: Marco's ate owns a unit in one of the charming condo developments in the city, so we had access to a lovely venue. The rent for the function halls were cheap too! I wanted to book the function halls by the pool, but by the time we had a definite date for the reception, they were all booked. I was bummed. If we couldn't hold the event here, where else could we find a venue 10 days before the wedding? But again, God works in mysterious ways. I was shown a different function hall away from the pool. This one had a lovely pathway leading to it, and it was tucked away in a part of the garden where no other residents were bound to come walking past. AND it was twice the size of the ones by the pool, but for the same price. We no longer had to worry about how we could sit our 80 guests comfortably. Lady Luck's kiss #3: Marco's family owns a restaurant in Laguna called Oji's Grill. They serve the yummiest food! So it was a no-brainer - the reception should be catered by them. We ordered grilled liempo, fish fingers, chicken ala king, and kare-kare. They even prepared bagoong rice - a bonus! Lady Luck's kiss #4: Marco had cousins in Davao, so we were able to order lechon (roast pork) from Matina! The lechon was probably the guest of honor at the reception, teehee. It had to be specially flown in, and fetched from the airport. And the great part about the reception? Lady Luck's kiss #5: My parents gifted us with enough money to pay for the food! Hallelujiah! Early on, I decided I was simply buying a dress off the rack. I knew how complicated - not to mention expensive - having a gown custom made was going to be. So I was simply going to look for a dress at the mall. The wedding was going to have a sort-of summery garden theme. Sort of because at this point I still wasn't decided if I was going to follow a theme or not. But I knew the motif was going to be aqua/blue. It was 10 days before the wedding. Other brides would have hyperventilated and died by now. Anyway, back to the dress. All I knew was I wanted something simple and comfortable. No gowns for this bride. It was a summer wedding, so I wanted something short. We weren't getting married in church, so I didn't have to worry about covering up. A couple of times, I saw something I liked, but they didn't quite feel right. I was getting dizzy from all the running around the different malls, I was about to give up. On the same day I booked the venue, I found the perfect dress! 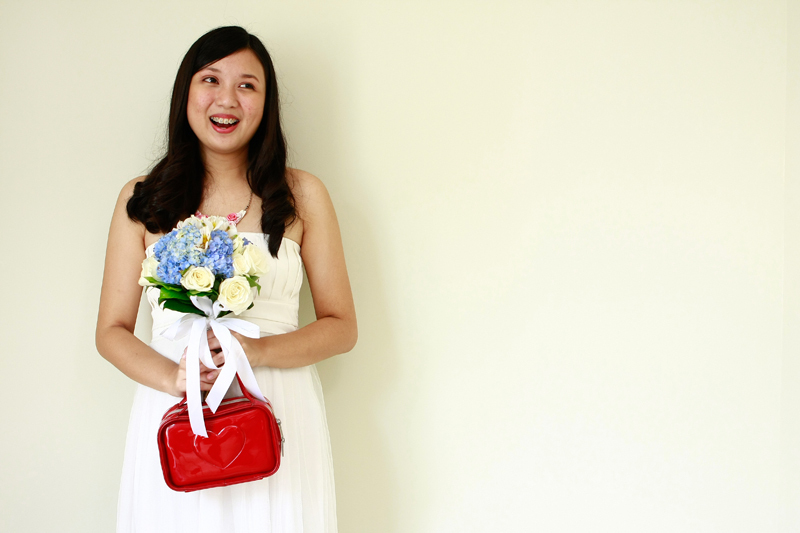 It was simple - no ruffles, no flowers, just a plain strapless dress with an empire cut and a flowy, short skirt. It was feminine without being frilly. And the best part? It was only Php1,600 (about US $35). Yes, just two zeros there, not a typo! Isn't it such a thrill to find exactly what you're looking for, even if you didn't know what you were looking for in the first place? And just when you were about to give up? Happiness! But stupid me didn't buy the dress right away because I wanted to sleep on it. Idiot. I did take out my Flip cam, and took a video of myself trying on the dress. I showed the video to Ate Norren, who told me I was crazy for not buying it outright. So an hour later, I went back to the mall with Marco to buy the dress. Good thing the mall was just walking distance, or I would have procrastinated and would have lost the dress. More wedding details in the next post. If you've been following this blog for a while, you might be aware that I was planning on getting married two years ago. It was going to be an elaborate Church wedding in the province. There was to be a gown (although I couldn't find what I wanted), an entourage (we were having trouble deciding on who was going to be given what role), souvenirs (I couldn't decide what to make!) - the works. The reception was going to be outdoors, at The Ruins - a romantic spot just like in that James Bond movie. 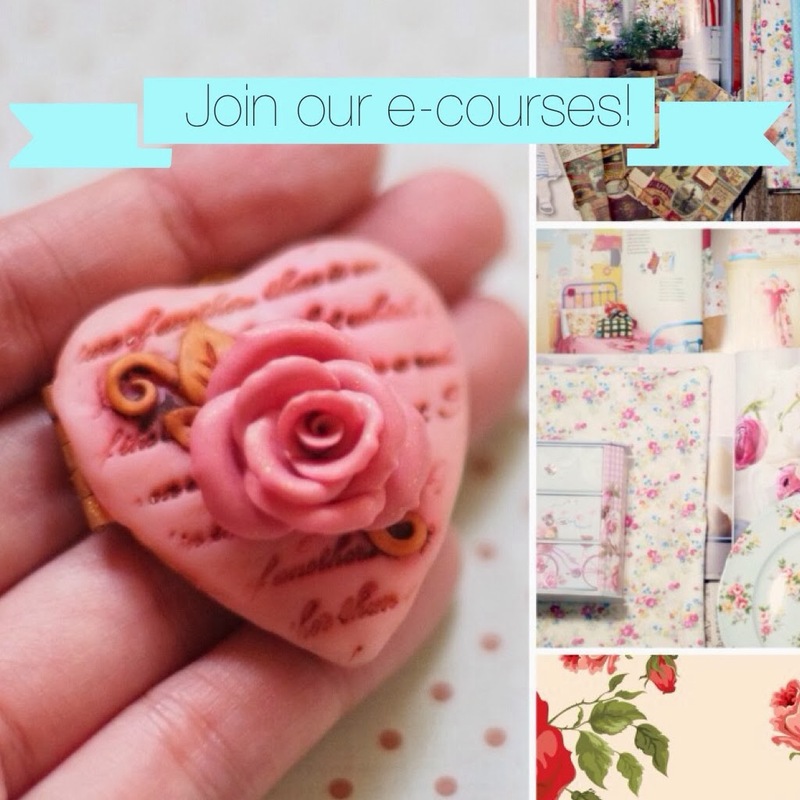 I was going crazy over the preparations, planning for the event a good eight months ahead. I was having trouble looking for a caterer, having trouble finding a wedding gown that was "me", having trouble with so many details! And having trouble with each other. Lol. As fate would have it, we didn't go through with it. But God truly works in mysterious ways. Because last weekend, after almost two years, He gave us the perfect wedding. 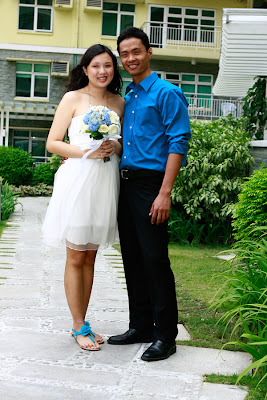 On April 2, 2011, I got married to my college sweetheart, my boyfriend of almost 9 years. The event was far from perfect, if you dwell on the details. 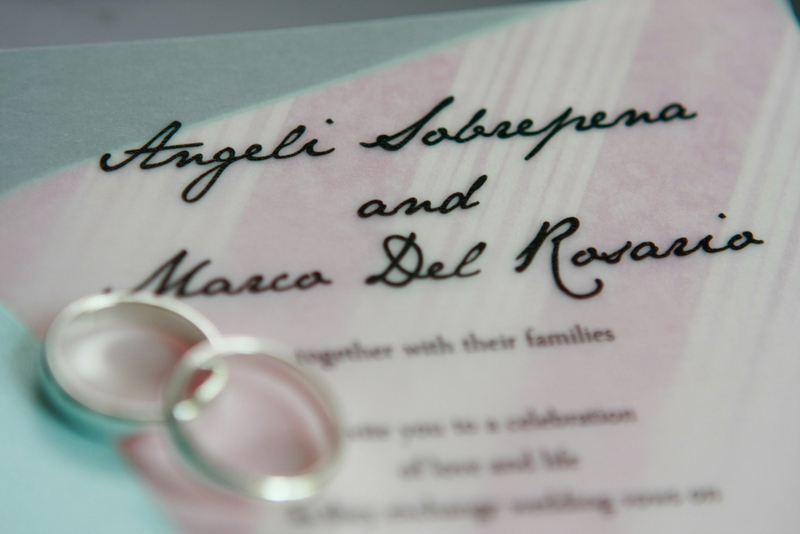 But it was the perfect wedding for Marco and I, because we got more than what we hoped for. All we wanted was to get married, period. But what we got was a beautiful and truly special event. It didn't take months of preparation - would you believe we pulled it off in two weeks? It didn't take a gazillion funds to pull off - we only spent a third of what we would have spent for the original wedding. Sweet and simple, just like we wanted. All it took was the help of our family, a little creativity, a ton of prayer, and a kiss from Lady Luck. Details in my next post. 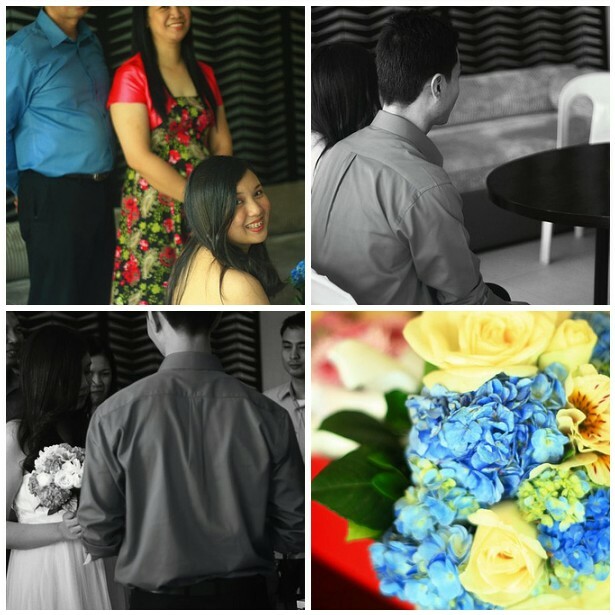 :) Meanwhile, enjoy a few snapshots of our wedding taken by my cousin Kat.